A "land based explosion" rather than a meteorite is more likely to have killed a man and injured three others in a mysterious blast in Tamil Nadu last week, scientists at the US space agency, National Aeronautics and Space Administration said on Wednesday. On Saturday, a man was killed and three others were injured in a mysterious explosion in Vellore district of Tamil Nadu. Chief Minister J Jayalalithaa had said that it was a meteorite that caused the mishap at the campus of a private engineering college. If true, this would have been the first scientifically confirmed report in history of someone being killed by a meteorite impact. However, NASA scientists in the US said in a public statement that the photographs posted online were more consistent with "a land based explosion" rather than with something from space, The New York Times reported. The explosion, which created a crater, occurred near the Bharatidasan Engineering college complex at Natarampalli with eyewitnesses claiming that the object fell from the sky. A bus driver, identified as Kamaraj, working in the college lost his life after the object fell near him as he was walking past the building. Three gardeners suffered injuries and were admitted to a local hospital. Windows of the college buses and several glass panes of the building were damaged at the site. The police recovered a black, pockmarked stone from the site. Scientists from the Indian Institute of Astrophysics were analysing samples of the rock provided by the police. "Considering that there was no prediction of a meteorite shower and there was no meteorite shower observed, this certainly is a rare phenomena if it is a meteorite," G C Anupama, the dean of the institute, was quoted as saying. 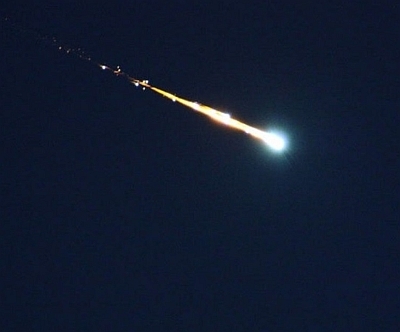 Lindley Johnson, NASA's planetary defence officer, said that a death by meteorite impact was so rare that one has never been scientifically confirmed in recorded history. The object recovered from the site weighed only a few grams and appeared to be a fragment of a common earth rock, she said. Rs 95,000 per month not enough for Telangana legislators; want more!